Herbs are the perfect plants for an indoor or outdoor container garden. Most can be grown anywhere as long as you give them enough sun (eight hours a day is optimal) – a windowsill, your front steps, on the patio, all will do. When winter comes, an outdoor pot can be moved indoors for year-round fresh herbs! In addition to bringing your meals something extra, herbs bring fragrance into your home. You don't need a ton of herbs to add fragrant touches to your home-cooked soups and stews, so your container can be planted with a variety. A handy combination is basil, chives, parsley, and sage. Other herbs that do well in container gardens include thyme, rosemary, mint, tarragon, oregano, and cilantro. Thyme, rosemary, oregano and tarragon prefer less watering; the others thrive in moist, but well drained soil. Of course, you'll want to pick those herbs that you use most often in your favorite dishes. Choose an attractive container that can hold at least three gallons, or more, of potting mix and that drains well. Potting mix works better than potting soil. A larger container provides space that will promote healthy root growth and stays moist longer. We suggest that you buy plants, rather than starting from seeds. That way, you can use them in your recipes right away! Arrange the herbs you've selected decoratively – your garden will look good and taste good, too! Just as in your garden, when planting, think about varying heights and leaf colors to take advantage of the beauty these herbs have to offer. You can add flowers, too, to your containers. Pansies, nasturtiums and marigolds are pretty, and edible. You don't need to fertilize the herbs too often since they have a relatively short life, but a liquid house-plant fertilizer is useful. As the herbs run their course, you can replace them so that there's always a nice, fresh supply for your kitchen. Keep your herbs trimmed and cut off any blooms as soon as you can. With herbs, it's all about the leaves and blooming changes the taste of the leaves. 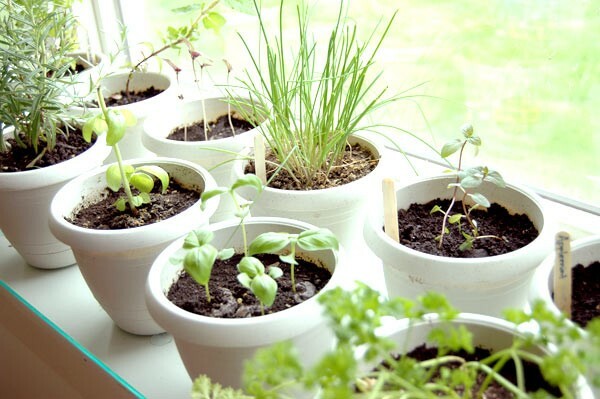 Do you have a container herb garden? Share your favorite recipes that use fresh herbs, below.